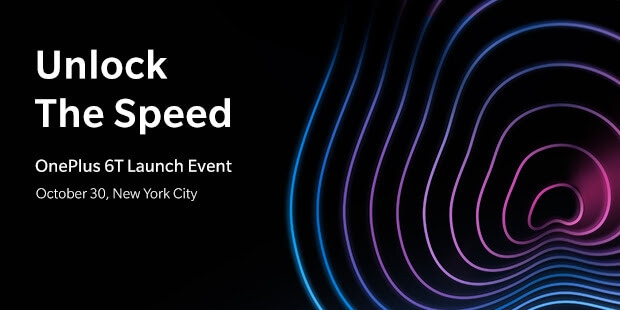 As expected, OnePlus have announced the launch events for the OnePlus 7 Series in London, New York, Bengaluru and Beijing. Branded “Go Beyond Speed”, the teaser trailer is a short 11 seconds long. With the moniker of “Series”, there’s now no doubt there will be more than one model, and they’re going to be different designs. Expect to see a 7 Pro to go up against the top-tier Samsung devices alongside a more humble 7. The video, posted to Twitter by Pete Lau, CEO of OnePlus, allegedly runs at 90 fps which suggests that the new (7 Pro) phone will have a screen with a matching 90 Hz refresh rate. That’s up from the normal 60 Hz of an ordinary smartphone. I don’t know how to confirm the video frame rate so will have to take it on trust. The trailer doesn’t reveal much else. There are the expected swooshes, curves and vents but no real giveaways as far as I can tell, though it looks like the ever popular alert slider is still there. There are some renders of both the 7 and 7 Pro floating around the web, with the 7 Pro sporting a pop-up camera. The 7 looks substantially the same as the 6T so expect the same in-display optical fingerprint reader. As usual for OnePlus, there are opportunities to buy and win tickets for the launch events. Checking the London event, tickets are still available at GB£16 for early birds. It’s GB£30 after Thursday and the ticket gets you swag and snacks as well as entry to the event. If you can’t be there, it’ll be streamed live too. Of course, the big unknown for both the 7 and 7 Pro is price and we’re unlikely to discover that with any certainty until 14 May. I’d say it’s a safe bet that the OnePlus 7 is going to be announced. Rumours abound as to the details. Is it going to have a pop-up camera? Is there going to be a “Pro” model? Is there a 512GB version? Who knows, but OnePlus rarely disappoints. Watch this space for more news on Tuesday. OnePlus has officially unveiled its latest flagship, the OnePlus 6T at a live event in New York. Announced a day ahead of schedule to avoid a conflict with Apple’s autumn event, the 6T’s features were in line with expectations based on leaks, both official and unofficial….but let’s follow along with the keynote. Starting bang on time, OnePlus founder and CEO, Pete Lau, took to the stage for the first time at a OnePlus launch. He welcomed everyone to the event, thanked the community and reminded everyone of OnePlus’ history starting with the OnePlus One. He then announced that OnePlus is officially partnering with T-Mobile in the US and the 6T phones will be available through their 5,600 stores. Pete then handed over to Kyle Kiang, OnePlus Head of North America Region for the big reveal. Before that, he thanked the OnePlus community that now has over 5 million registered users. Finally, the 6T specs…. The new screen unlock brings the fingerprint sensor in under the front display towards the bottom, which is great, because having the fingerprint sensor on the back of phone was a really stupid idea. Apparently the sensor was first tried out on the 5T but performance wasn’t good enough. On the 6T, the sensor will unlock in 0.34s – apparently it’s the fastest in-display sensor in the world – and it will learn your fingerprint better over time. For comparison, the OnePlus 5 fingerprint unlock takes 0.2s so there’s some penalty putting in under the glass. The new 6.41″ AMOLED screen is 1080 x 2340 pixels, giving 402 pixels per inch. OnePlus give a slightly odd aspect ration of 19.5:9 which I feel ought to be 39:18 but there you go. At max brightness, it’s over 600 nits, and covers over 100% of the sRGB gamut. There’s a very neat notch at the top and the screen’s been extended at the bottom too. The 6T will come in two finishes at launch, a ceramic Mirror Black and a metallic Midnight Black. The phone is 157.5 x 74.8 x 8.2 mm and weights 185 g. That’s nice. Memory options are 6 GB / 8 GB RAM and 128 GB / 256 GB storage. 64 GB is history…. For photography, there are two cameras with 16 megapixel & 20 megapixel sensors, plus both OIS and EIS. You can do slow-mo at 480fps! The 6T addresses one of the main criticisms of the 6 – the low light photography wasn’t great – and comes with Nightscape, which is a proprietary HDR and post-processing algorithm to improve pictures at night. The demoed photos are very impressive. As there’s no change in the camera hardware between the 6 and the 6T, Nightscape mode is going to be available on the 6 as well. Kevin Abosch, OnePlus Innovation Director and photographer took to the stage to talk about Studio Lighting, which improves portraiture photography by accentuating facial features in shadow. Looks impressive. Back with Kyle, the OnePlus 6T has been optimised for gamers with Smart Boost. This combination of hardware and software uses the 6T’s RAM as storage which allows gaming applications to load faster. It’s not insignificant at 20% faster load times. The battery has been upped to 3,700 mAh battery from 3,300 mAh in the OnePlus 6. Along with software improvements, this translates to 23% improved battery life. It’s not all hardware. Software in the shape of OxgenOS has been tweaked too with improvements across the board in stability, features and experience – it’s a mantra of “fast and smooth” with over 500 optimisations. Based on Android 9 (Pie), OxygenOS now comes with Full Screen Gestures 2.0. Yes, there’s no 3.5 mm headphone socket, but OnePlus now has Bullet Type-C headphones (US$19.95) with a USB C connector and a Cirrus Logic DAC. Or else it’s full Bluetooth with Bullets Wireless (US$69), which have a special 5th Anniversary edition in red. 10 minutes charging gives 5 hours of listening pleasure. The 6T will be available from the OnePlus on-line store from November 1 in the US, 6 November in Europe, costing US$549 / GB£499 for the 6+128 GB version. No invites required these days. If you are in the US and want to get on-board with T-Mobile, there are some fairly incredible trade-in offers especially if you have an older OnePlus model – $300 off with a OnePlus Two! There are pop-ups round the world too if you want to get yours quicker. The London one is 31 October 11:00am – 7:30pm at The Music Room, 26 South Molton Lane, Mayfair, W1K 5LF, UK. If you want to watch the keynote for yourself, it’s on YouTube. The presentation begins around the 30 minute mark. With only about a week to go before the launch of 6T, OnePlus have been busy keeping themselves in the news. Here’s a quick round-up of the latest tidbits on the smartphone front. First up, OnePlus have brought forward their showcase event by a day to 29th October to avoid being overshadowed by Apple’s autumn announcement which was scheduled immediately after OnePlus’ original event. The location is unchanged and it’s still at 11am EDT/ 1500 GMT, Pier 36, New York City. Graciously, OnePlus has offered to cover the additional travel costs of ticket holders who need to change their arrangements. 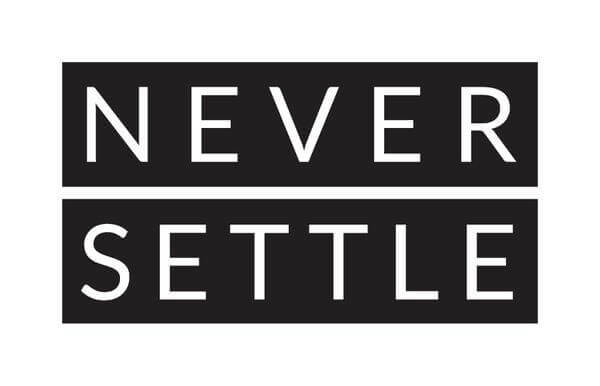 Secondly, OnePlus have announced a slew of pop-up events in India, Scandanavia, Western Europe and North America. These start from 29th October and the 6T will be available for sale at the pop-ups. Next, a leak on a German retailer’s website has confirmed that the 6T will come with a larger battery. The listed specs suggest that 6T will come with a 3,700 mAh battery rather than the 3,300 mAh of the 6. The listing mentions microSD for expandable memory which would be a first for OnePlus, so take that with a pinch of salt. Finally, even though the 6T isn’t out yet, OnePlus co-founder Carl Pei has been commenting on the OnePlus 7 which will be one of the first phones to support 5G in 2019…whatever that means. OnePlus continues to build the hype ahead of the 6T smartphone launch with a teasing tweet on Twitter. Posted at noon GMT, the message simply says, “Check back in 24 hours for an exciting announcement. #OnePlus6T“, along with a photo showing the lower rear of the new smartphone. 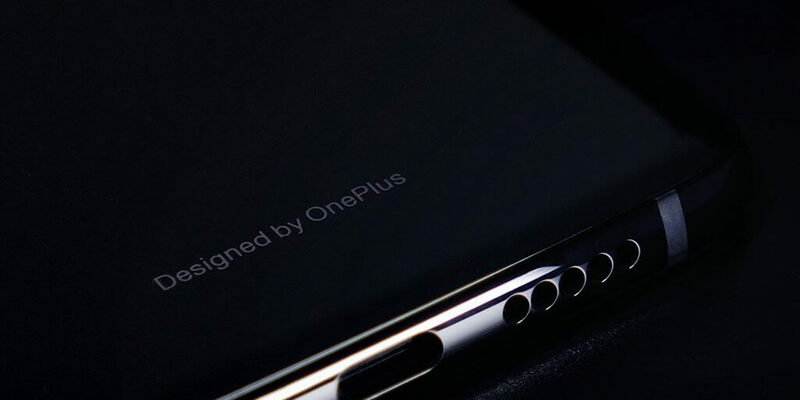 There’s not much to be gleaned from from the picture as it only shows the USB C port, a speaker grille, part of antennae and “Designed by OnePlus” written on the back. 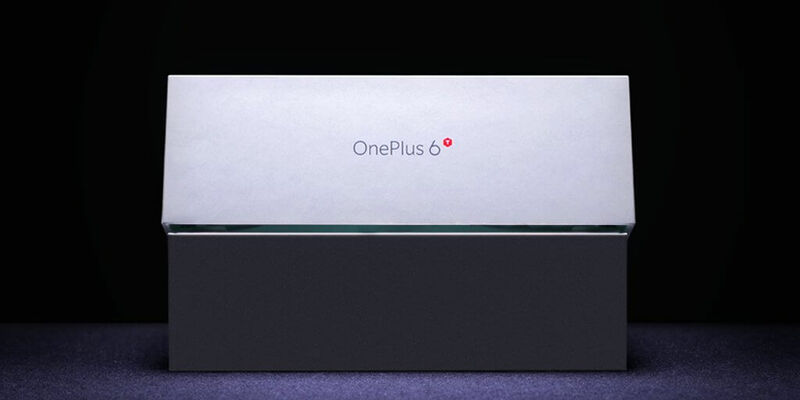 Sticking to its biannual smartphone release strategy, OnePlus’ CEO Peter Lau all but announced the new device in an interview with CNET last week. The latest tweet reaffirms the new phone is expected to be formally revealed this month. Ever since the 3 was followed by the 3T (which I currently own), OnePlus has followed a pattern of spring and autumn releases, with the later smartphone mainly being a boosted model with a faster processor. In 2018, it looks like the 6T will be arriving a month earlier and will be significantly different from the current 6. Most notably, the 6T is coming with an in-display fingerprint sensor, Screen Unlock, but will be losing the headphone socket. After being a staunch support of the 3.5mm audio socket, it seems that this will be removed to make way for the fingerprint sensor. The headphone socket itself moved from top of the phone to bottom between the OnePlus 2 and 3 models, and with the fingerprint sensor moving from the rear of the phone to the display on the front, the space below the screen is needed. Goodbye headphone socket. Diehards will be disappointed in the loss of the headphone socket but I moved to Bluetooth headphones at least a year ago and haven’t looked back. My latest tablet, the Huawei Mediapad M5 doesn’t have a socket either. I think that’s a complete cop-out. Surely I can judge for myself whether I need slower wireless charging versus fast wired charging? I can’t believe that it’s been nearly ten years since the Palm Pre came out with wireless charging and it’s still not a standard feature on smartphones. Flagship killer or not, the 6T can’t have everything and still be delivered at mid-range price, so it’s not unexpected to see some features left out. Nevertheless, the 6T is expected to see a small bump in prices, somewhere in the US$25 range, which still prices the smartphone very competitively. OnePlus is the now #4 smartphone OEM in Western Europe after Apple, Samsung and Huawei. I’m hoping for a “just one more thing” moment and OnePlus introduces a decent spec tablet for half the price of the Samsung Tab S4! Messaging is one of the killer apps for mobile devices and has followed the industry from first mobile phones through to the smartphones of today. It began with SMS, became notorious with Blackberry, integrated with social media and then became a battleground with law enforcement as end-to-end encryption kept conversations private. I receive a handful of texts each day with the usual range of personal, work and spam messages. Some get deleted, some don’t, but by the end of the year, there’s probably over 1000 messages cluttering up the inbox. Texts don’t take up much space so there’s no imperative to have a clear out but eventually it has to be done. 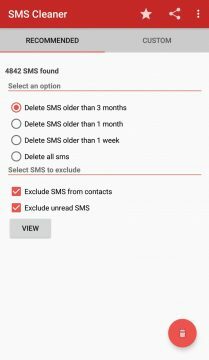 Surprisingly, the standard Android SMS app Messages doesn’t have any management features at all and it’s not possible to delete messages in bulk. I want to be able to delete all messages more than two years old or, say, set a limit of 2000 messages. No can do, and it’s not a feature that I found in any other of the SMS clients that I downloaded. 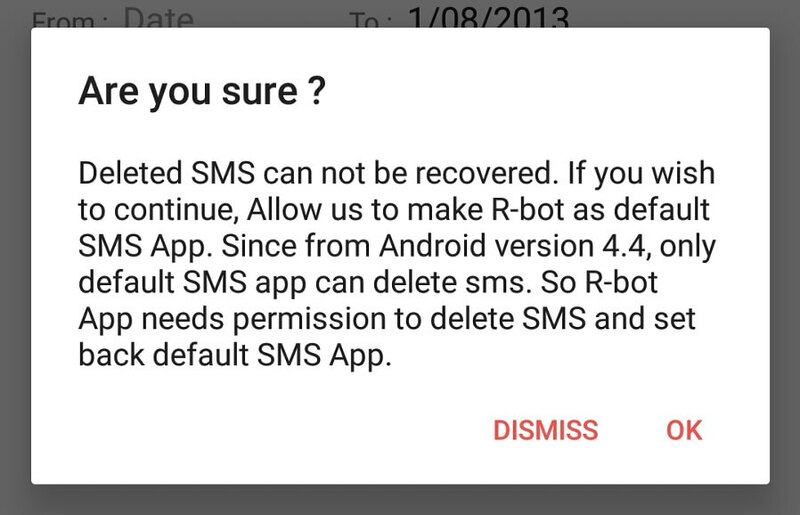 Fortunately, I did find R-Bot SMS Cleaner which does delete old text messages. Hurrah!!! 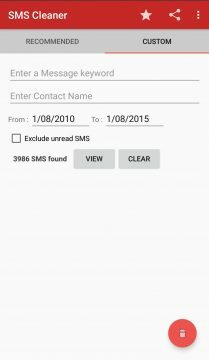 To be clear SMS Cleaner isn’t a messaging app and all it does is find and delete old messages, but it does the one task pretty well. 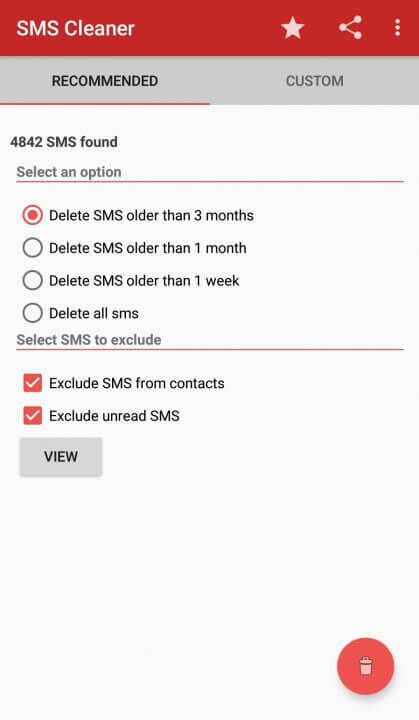 It has two modes, one called “Recommended” which deletes text messages older than a few months or weeks, and “Custom” which allows a more granular selection. 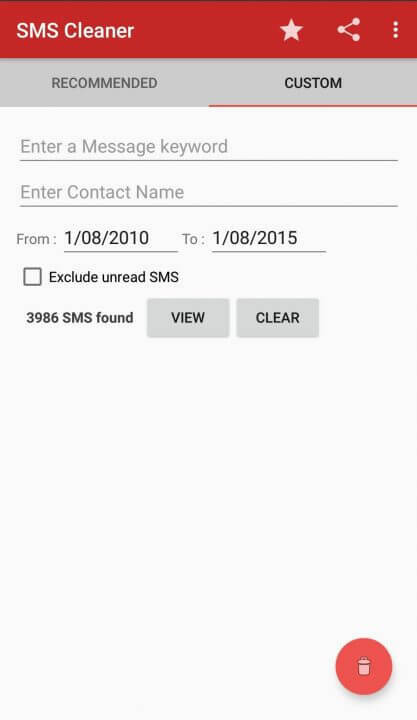 With Custom, it’s possible to look for messages with keywords, specific contacts or in a chosen date range. The “View” button shows the messages found by the search for double-checking before deletion. 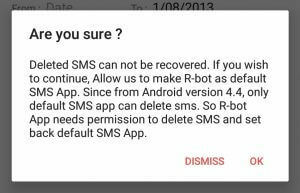 Once ready, deleting needs R-Bot to switch in as the default SMS app, which it politely requests, and then switches out when done. It’s a very well-behaved app. Adverts are displayed occasionally but there doesn’t seem to be a paid-for “pro”, which I would prefer. The only “bug” I found is that there is an option in “Recommended” to exclude texts from contacts, the idea being that it’s an easy way to get rid of spam messages which typically come from unknown numbers. Normally, it works well, but it did get confused by international dialling codes. If a number was prefixed by, say, +1, +44, +353, SMS Cleaner wasn’t able to recognise that as belonging to a known contact. Just watch out for that. 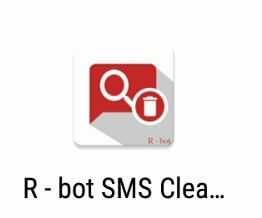 Overall, R-Bot SMS Cleaner is a handy app for keeping the SMS inbox under control. Try it out or if you’ve a better suggestion, let me know in the comments below.